Recently, JBA 4 Resilience was involved in a successful week of simulated exercises with the Environment Agency (EA) for Exercise Bernicia. 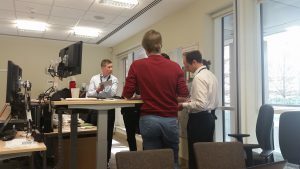 The event saw frontline staff in two EA area offices roster incident duty staff to take part in a mocked-up significant coastal, fluvial and snowmelt exercise which mimicked the 2013, 2015 and 2018 flood events in the North East EA Area. JBA 4 Resilience is a partnership between Training 4 Resilience, Crown Media, NSC, Waves Training Solutions and ourselves. Together, we design and deliver training and exercise solutions for EA staff in order to build confidence and competence in their incident roles and responsibilities as part of the EA Incident Management Training and Exercising Framework. The exercise involved staff from the JBA Newport, Exeter, Warrington, Newcastle and Coleshill offices, with design and delivery support from T4R and media injects created by Crown Media. Three duty roles were being exercised; Monitoring and Forecasting Duty Officers (MFDOs), Flood Warning Duty Officers (FWDOs) and National Flood Forecasting Duty Managers (NFFDMs) with the exercise objectives and scenarios designed to improve confidence and embed response amongst EA staff. The simulated exercise was delivered using JEMS (JBA Exercise Management System) part of the JBA 4 Resilience EnvirEx suite, facilitating decision making based on river and rainfall data and enabling staff to make informed judgements on issuing flood warnings and flood alerts. As the scenario progressed, we found ourselves ‘swept away’ by the event – caravans floated off downstream and simulated teams were deployed to river pollution incidents. Hundreds of properties suffered flooding and five Severe Flood Warnings were issued, causing schools and major roads to close. The exercise was enhanced by simulated Media and Corporate Communications teams and National Operational Incident Management team (NOIMT) calls. JBA 4 Resilience staff took part in the exercise simulating the roles of owners of flooded houses and businesses – Phil Emonson played the role of National Duty Manager (NDM), Hannah Hogan was Area Base Controller (ABC) and with the huge efforts of Sara Lane-Dredge, Shelley Evans, Adrian Seward and Beverley Osborne of T4R and a wider support team, we ran a successful three-day exercise, briefings, debrief and staff handovers. As JBA 4 Resilience has been successful on both Lot 1 and 2, this gives the consortium the opportunity to train staff and incident roles within Lot 1 training sessions, whilst embedding this learning within exercises as part of Lot 2, to maintain excellent levels of emergency preparedness. The framework offers ample opportunity for JBA 4 Resilience to provide a comprehensive training and exercise package to every level of EA command and control – covering Tactical, Strategic and Operational roles – everything from senior managers to support officers. Email Peter May, Phil Emonson or one of the JBA 4 Resilience team to find out more about the prestigious training and exercising for the Environment Agency. You can also find out what other services we can offer to the private sector, government and third sector partners on our flood resilience web page.